We are happy to announce that we had a very successful Lunch and Learn Event! We appreciate the time the speakers have taken to educate everyone on the opportunities and challenges of owning a business. Enjoy pictures of the event here. Click on this link to become a member. Please be sure to select OCA Colorado as your local chapter. for comments, questions or further information. Founded in 1973, OCA aims to embrace the hopes and aspirations of nearly 13 million Asian Pacific Americans in the United States. OCA is engaged in organizing its over 80 chapters and affiliates across the nation to develop both leadership and community involvement. OCA chapters and our organizational and college affiliates are establishing strong local programs in all parts of the country. OCA's base in Washington, D.C. gives the national office an effective vantage point for monitoring legislation and policy issues affecting Asian Pacific Americans. 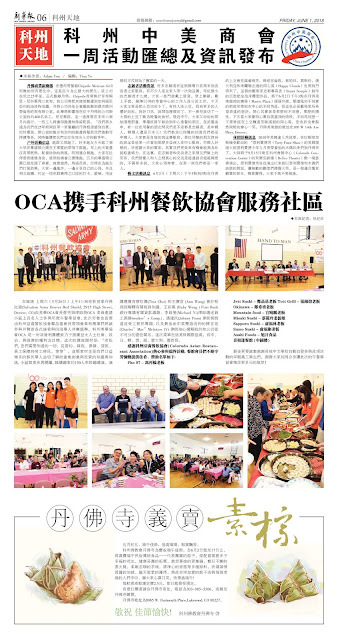 In addition, OCA is able to build national support and to work in coalition with other national groups around issues affecting Asian Pacific Americans. OCA takes no collective position on the politics of any foreign country, but instead focuses on the welfare and civil rights of Asian Pacific Americans in the United States. July 13, 2019, 8:00am; Panda Run @ Great Lawn Park. Registration is now open!